They’re cute, would not wither and when the celebration is over, it can be used as a bedside or home decoration. 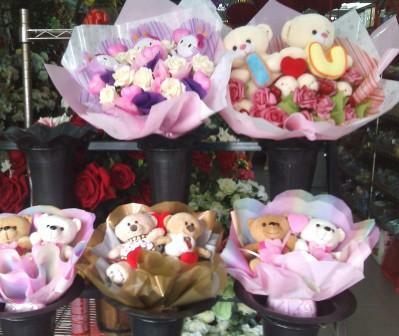 The above are sold outside a craft shop- and in between the teddy bears are plastic flowers. Yep, they say that fake flowers represent “fakeness” but it can also represent lasting love. The love should remain long after the flower withers…. Also, with the money saved on buying flowers on Valentine’s Day, both can get a good and memorable dinner.